Hello I LOVE your sock want to get it could I send money to you as I am having issues with paypal right now.If so i need snail mail address ,I will say it again I LOVE this sock . I'm glad you like it. I sent you a message on Etsy with my address. 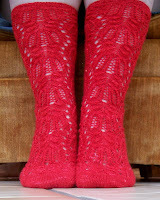 I copied so many of your patterns off of your blog and wanted to show my appreciation by buying the sock pattern. It says it is sold out on Etsy. I still want to buy it. Please let me know how to do this. Thank you for all the beautiful patterns. Someone apparently bought it right before you tried to. Sorry about that. I've relisted it here. I'm glad you like so many of my patterns. Thank you so much for your interest and your support. This sock in the natural looks really nice! Think you need to put a photo of Grandma's socks up here. 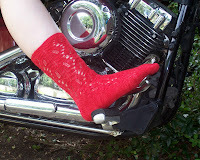 The red just doesn't show the great detail on these socks. When I click on the pictures on the main page, the pattern page that comes up is not what I clicked on. Love your designs! Which one(s) did you click on that took you elsewhere? All the links work fine for me. If you'll give me more detail, I'll certainly try to fix the problem.